Alexandr Na Yun Kin. Argentinian Tango on a Theme by A.Piazzolla "Adiós Nonino"
Alexandr Na Yun Kin. "U Golubya Sizogo Zolotaya Golova" (A Dove has a Golden Head). Video demo: Alexandr Na Yun Kin. Elegy from "Small Romantic Triptych". Video demo: Alexandr Na Yun Kin. New Year Overture (Joke). Video demo: Alexandr Na Yun Kin. Argentinian Tango on a Theme by A.Piazzolla "Adiós Nonino". Video demo: Alexandr Na Yun Kin. "Granada". On a Theme by Agustín Lara. Video demo: Alexandr Na Yun Kin. "Iz-Pod Kamushka". Fantasy on Russian folk song. Video demo: A.Na Yun Kin. 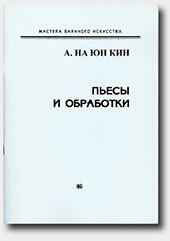 "Iz-Pod Kamushka" (From Under the Stone). Fantasy on Russian folk song. Video demo: Alexandr Na Yun Kin. "Kak u Babushki Kozyol" (There Lived a He-Goat at Grandmother's), Russian Folk Song . Video demo: Alexandr Na Yun Kin. "U Golubya Sizogo Zolotaya Golova" (A Dove has a Golden Head), Russian Folk Song.